A Monster Calls was one of my favourite books of 2012 and this song by the Bookshop Band, For An Ending, inspired by Patrick Ness’ book is simply put, perfect. It’s been Picture Book month this November and reading all the posts on picturebookmonth.com reminded me of a post I wrote almost two years ago on battling homesickness with picture books. Picture books really are special. They can cheer you up when you’re down, make you laugh time and time again, and more often than not they make you look closer, not just at the page but at life itself. They’re a way of seeing the world through another’s eyes; through picture book’s pages we’re introduced to the illustrators imagination and nothing can be as personal and important as that. Picture books really did get me through my homesick blues, and they still do. Shaun Tan and Oliver Jeffers are firm favourites, but I would also like to mention Rob Ryan, Polly Dunbar, Shirley Hughes (Dogger will forever and always hold a very special place in my heart), and the multi talented Alhberg’s for their upstanding picture books. I’ve asked for Children’s Picture books – The art of visual storytelling for Christmas, I can not wait to delve through and discover even more picture books to add to my already overflowing shelves. 4. 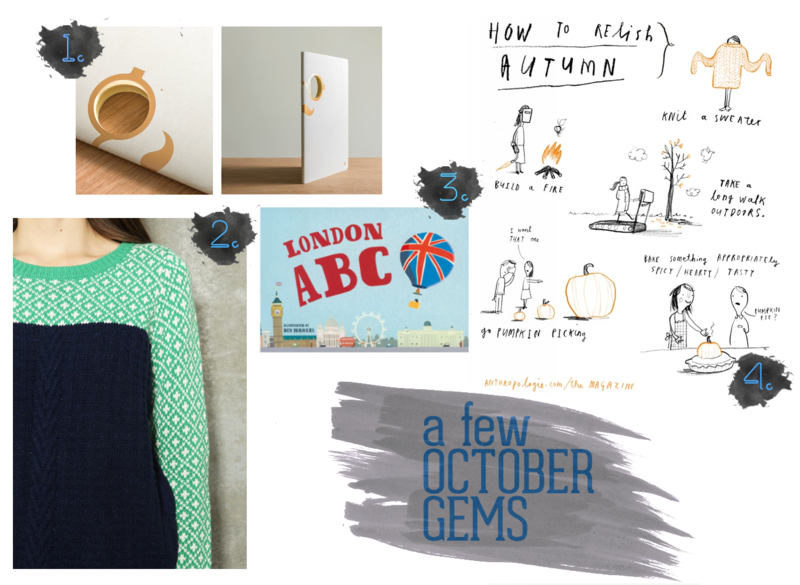 Darn straight: Oliver Jeffers’ ode to Autumn via Anthropologie. I couldn’t let it go past without mentioning that it’s Children’s Book Week this week. For me it’s pretty much always Children’s Book Week, to the extent that last week I thought I should probably read a grown up book, you know, to fit in with cohort, but upon remembering it was the best week of the year I have rapidly and far too happily swapped my copy of The Great Gatsby with John Green’s Paper Towns and Oliver Jeffers’ newest title This Moose Belongs to Me. I’m endeavouring to read a picture book a day, every day, either over my breakfast or with tea after dinner – who’s with me?! If you haven’t picked up a Children’s book in a while, do it, and use this week as an excuse to delve into the pages of artfully constructed stories with imagination, heart and hope. Booktrust have an excellent Best Book Guide to help you make your Children’s Book Week choices. Let me know if you read any delights!